Mount your Nikon F lens to your Fujifilm X-mount camera with this T Adapter from Metabones. Precision-crafted from brass and given chromium plating, this adapter is designed for daily use and will guarantee infinity focus. This model has a flocked interior that will limit flaring and ghosting from reflections inside the adapter, and a satin exterior finish matches that of most cameras for a unified appearance. Additionally, it has a detachable Arca-type compatible tripod foot for simple mounting to a variety of tripods. While this adapter allows users to mount a Nikon F lens on their Fujifilm X-mount camera, automatic functions such as autofocus and electronic aperture control will not be supported. Box Dimensions (LxWxH) 4.3 x 4.3 x 1.9"
Nikon F Lens to Fujifilm X-Mount Camera T Adapter (Black) is rated 3.4 out of 5 by 14. Rated 4 out of 5 by Anonymous from Great adapter for old nikon lens But the mount is a bit lose This is a very solid built adapter it connects to your fuji camera and nikon lens with no problem. You can use old series e, ai, non ai lens with this adapter.The mount at the fuji end is a bit lose for the LENS CAP, but not the body cap. So if you have a nikon lens attached to the adapter and put a fuji lens rear cap at the other end of the adaptor, it may fell off when transporting in your bag. Either be careful or just keep them separate. The tripod mount on the adapter is not removable. So you may have some trouble to remove the lens if a tripod is mounted. Other than that, it is a pretty good adapter. Rated 4 out of 5 by Anonymous from High quality adapter I use this adapter to fit old Nikkor glass to my Fujifilm X-T1. Works exactly as expected. Very high quality construction and super solid. If anything, it's a little TOO tight of a fit. There is a lot of resistance when attaching a lens, but at least the lens stays completely put and has zero wiggle room. Another thing that I would think may be a poor design decision is that the inside of the adapter is lined with a very fine black velvet-like material. I understand that this is used to prevent excess light reflections but if rubbed hard enough the material can create a very fine black dust which could possibly get onto the sensor or optics. Solid adapter though. Glad I spent a little extra to get high quality. Rated 5 out of 5 by Mike S. from Perfect for Nikkor AI/AIs lenses, or Zeiss ZF/ZF.2 I have used a MetaBones Nikon F to Fuji X adapter for years, and have another one Nikon F to M43. I have not any problems attaching my many Nikkor AI/AIs and Zeiss ZF lenses and found the machining and tolerances on the MetaBones adapters to be fine. I don't know why some of the other reviewers had difficulty attaching their Nikkor lenses - maybe there was a bad manufacturing batch, or maybe there was user error. I want to comment on the tripod mount foot - it is removable if you don't want to use it - it just requires two screws to be taken off, and it can be easily reversed. I prefer to leave the tripod foot attached for several reasons: 1) when not using it on a tripod, it is small enough not to bother me (but I have big hands), 2) when using a tripod, it tends to be near the center of balance between a full-frame lens and a mirrorless body, 3) for really big lenses with their own tripod foot such as the Nikkor ED 300/2.8 I haven't found any mechanical interference, 4) I tend to use normal and telephoto lenses more than retro-focus designs, and with a simple non-focal-reducer adapter like this these end up having enough magnification to benefit from using a tripod in order to get sharp photos 5) for video work (more on my Panasonic GH4 than on my Fuji X body) I invariably use support devices, be they a video tripod, monopod, shoulder rig, stabilizer, jib or slider That brings me to the one item which is an inherent limitation of the tripod foot - it doesn't rotate into a 90-deg position, so unless you want the mechanical compromise of putting a tripod head at a 90-deg position, it will be far easier to stay with the landscape vs. portrait aspect ratio. It makes me wish for a square digital sensor, like the 6x6 medium format cameras I used to use many years ago. Rated 4 out of 5 by Jim from Solid & It Works! I use this with a couple of my old Nikkor lenses and it does the job. Maybe it's a bit tight on the F mount end but that hasn't caused any big problems for me. 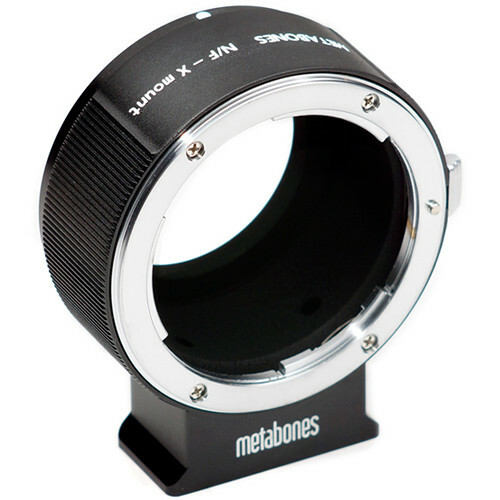 The Metabones adapter is solidly built and comes in a nice plastic case to store it in when not in use. Rated 1 out of 5 by News Strategies from Metabones adapter fails on Nikon end I bought this adapter hoping to use my older Nikon F lenses with my Fuji X-E2. The Metabones adapter smoothly mounted to my Fuji camera body ... BUT the adapter will not accept any of my Nikon F lenses. Not wanting to force a match, I tried every possible way to connect the Nikon F lenses to the adapter. No joy. I returned the Metabones adapter and do not recommend it. Rated 2 out of 5 by Pablo from Fits loose The adapter fit loosely (Nikon f). ?The finish looked great, since the price is high and Metabones has an excellent reputation, it is unacceptable the fit wasn't tighter. I do not recommend it. Never again. I have a Lens Baby old model Control Freak with a Nikon F mount. Will this Metabones adapter allow the Control Freak to mount on my Fuji XT-2 without any issues filling the frame? I'm not 100% certain but what I can tell you for certain is the Metabones adapter does not affect the lenses focal length whatsoever. If your Lens Baby control freak is designed for a crop sensor such as your Fuji XT-2 then the adapter should not increase/decrease focal length or affect sensor coverage. I think you should be fine. If you do get vignetting if that's what you're worried about at least BH has a very easy return policy, just keep all the packaging. Can I use a teleconverter with this adapter? Thinking vintage Nikkor micro with Fuji X. Can I use Nikon AI Manual focus lens with this adapter? Yes, it will work with AI, AI-S and non-AI manual focus lenses. I never tried, but imagine it will work with the AF D lenses that still have an aperture ring (with manual focus). There is no coupling between the lens and the camera. Youll need to use Manual or Aperture priority exposure metering. Will this adapter work with a Nikon AF lens? This adapter works with Nikon lenses that have an aperture ring (Nikon F lenses). If you have Nikon G lenses (with no aperture ring), there is a different adapter you can get, Nikon G Lens to Fujifilm X-Mount. Remember that everything will be manual, including the focusing, so AF lenses are okay to use, but you have to do the work. will this adapter work on my fuji xt3? I don't know, I use an x-t2. But the fit on the x-t2 sloppy, but seems to sorta work - I rate it 2+.